In recent years, a string of corporate scandals have sent shockwaves throughout the business world, resulting in the fracture of public trust in corporations. Now more than ever, corporate honesty and integrity are directly connected to success and growth. 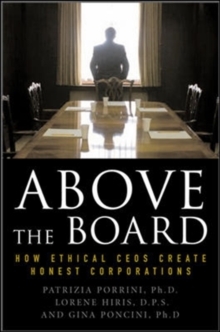 Above the Board provides strategies and methods to help you build a solid foundation of ethical corporate values into your organization. Inside, you'll find key advice from CEOs who have put corporate ethics at the forefront. The common message is that business ethics should not be viewed as an "add-on" to a company's operations; rather, it must be a key element in an overall strategy for success. "Organizations across a range of industries are faced with the challenge of fostering an ethical environment that goes beyond compliance," the authors write. "Above all, it is the CEOs who are in a position to set the ethical tone and climate of their organization." Above the Board offers concrete practices, procedures, and personalized approaches used by such companies as Whirlpool, Xerox, Walgreen Co., Texas Instruments, and P&G to help youMake integrity a core value for every employee Integrate ethics into the heart of your corporate strategyCreate wide-scale transparency throughout your companyHarness ethical energy and make ethics messages far reachingBuild a system of ethics that will remain relevant well into the futureAbove the Board provides insight, best practices, and success stories from CEOs who began building upon their corporations' foundational principles early on, and it sheds light on how these initiatives have benefited shareholders, customers, and other stakeholders alike. This insightful look at the new way of doing business is an invaluable blueprint for nurturing ethics within your company, creating a permanent foundation of fresh corporate values, and putting your company in a solid lead against the competition.